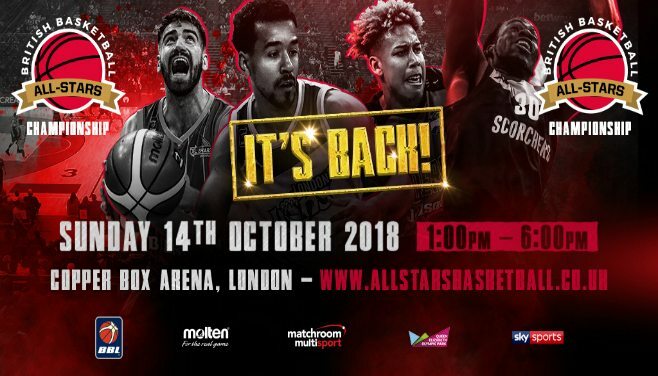 The British Basketball All-Stars Championship will return on Sunday, 14 October at the Copper Box Arena, London, with tickets on pre-sale from Monday 12 February and general sale on Tuesday 13 February. The All-Stars Championship made its debut last year, with London Lions running out winners over Esh Group Eagles Newcastle in a tense final. Matches are just 12 minutes long and an all-Star 5-point line offers rewards for those willing to brave a shot from distance – as Mackey McKnight found when his last-second five pointer saw DBL Sharks Sheffield defeat Worcester Wolves 37-35 at last year’s tournament. Teams will also have a two-minute golden buzzer Power Play at their disposal, during which any points scored will be doubled. The tournament will again showcase the best of British basketball talent, with defending champions London Lions joined by the top seven teams from this season’s BBL. Double elimination will be in play to separate the teams from eight down to four ahead of the semi-finals and final. Matchroom Sport Chairman Barry Hearn said: “The inaugural British Basketball All-Stars Championship was a great success last year and was so well received by fans, teams and players alike. The tournament already has a place as a key date in the British Basketball calendar and it’s our job now to grow this fantastic tournament. Bob Hope, British Basketball League, Commercial Director added: “BBL are thrilled that the British Basketball All-Stars Championship is to be staged again later this year and that the event is going to be broadcast extensively on Sky Sports. “The hugely exciting inaugural event last September achieved great exposure for basketball and drew in new fans to the sport. Tickets for the 2018 British Basketball All-Stars Championship will be available via www.allstarsbasketball.co.uk with tickets priced at £20, £30 and £40 with courtside hospitality tickets available at £99. Under 18s receive 50% off and family and group discounts will be available. Previous BBL ticket buyers will be able to access the ticket pre-sale on at midday Monday, February 12 ahead of the general sale at midday on Tuesday, February 13. Those eligible for the pre-sale will receive an email in due course. The 2018 British Basketball All-Stars Championship will take place 1-6pm on Sunday, October 14 at Copper Box Arena, London.